The monk or nun is a person of prayer living in solitude in the sense of being apart from society; but the monk and nun remain connected to the human world and God’s creation as well as to the members of their communities through thanksgiving, praise and adoration; through contrition for whatever harm we have wrought. The daily celebration of the Divine Office and the Eucharist is central to our life in God’s service and service to one another. Our community life is given us by the Church and our communal witness of living this life is the ministry by which we contribute to building up the Church. This is our responsibility: to bring the Gospel wherever we live by living that Gospel in silence and solitude. As others are called to spread the Gospel by verbal proclamation, we are called to procalim it by how we live together. This is the mystery we contemplate in our life together: God with us, God incarnate in the human condition. Our Work. Being human, our vocation is characterized by manual labor. As St. Benedict wrote: “Then they are truly monks, when they live by the labor of their hands as did our fathers and the apostles.” By our work we not only strive to support ourselves and shoulder, with the rest of the human race, the uncertainties of earning a living, but we have the opportunity to use wisely the limited resources of our creation and to consider the Creator revealed in his works. We also affirm the sanctity inherent in the human condition and the dignity of workers, shared by Jesus the carpenter and redeemed by his death and resurrection. 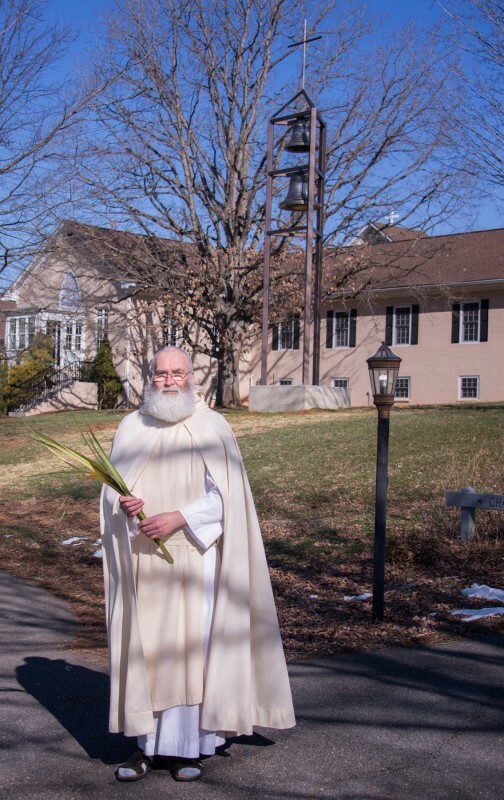 Here at Holy Cross Abbey, this engagement takes the form of caring for our land and buildings, the elderly and infirm monks, cleaning and cooking, attending to our guests in the Retreat House and visitors to the Abbey. We also administer the natural cemetery, maintain the quality of Monastery Bakery Products and a small shop for religious books and articles. Our Day. The balance of our day, poised between prayer and work, is also nourished by our reflective study of divine things in Holy Scripture. In this lectio divina, as in work and prayer, we seek God who has revealed himself in history, communicated by the sacred authors and the traditions of the Church. As in every other Cistercian monastery, we rise long before dawn for the night Office of Vigils, followed by silent prayer. The hours between Vigils and the morning Office of Lauds with Mass, are given over to Scripture, other sacred reading, personal prayer and meditation. After the morning’s work and a simple noon meal together, there is a period for rest and reading before Midday Prayer and the afternoon’s work or study or community meetings. The monk’s day leads up to the evening Office, or Vespers, a light supper and quiet time before the final Office of Compline. Then we retire for the day and the Great Silence begins; it will continue through the next morning’s Lauds. And so we learn to cultivate the stillness in which we respond to God in prayer, in God’s Word and in the events of community life. Our Calling. We strive to live for God, in Christ and his Church, by doing the ordinary things common to the entire human family. Our life attempts to recognize how our human existence discloses the saving work of Christ and has been encompassed by him. For all our faults and failures, we nonetheless seek God by opening ourselves to his saving grace, to be re-formed into the image of God’s Son. Indeed, our goal is not different from that of any committed Christian but it is lived on the frontiers of the evangelical counsels as a call to follow Christ who was “driven by the Spirit into the desert” (Mark 1:12). There, testing the limits of our human frailty, we hope to reflect God’s loving presence which we know as his mercy and forgiveness. The Monastic Future. In today’s world of contrary values and global problems, the monks of Our Lady of the Holy Cross, like other monks and nuns, like religious and Christians everywhere, strive to respond to our present challenges with the hope and trust of the Gospel. In so far as is humanly possible, we are preparing for the future with our gifts, talents and resources so that our mutual service and hospitality may serve future generations. Whether you feel called to the monastic life or admire its contribution to the Church, you too can insure our continued fidelity by praying with us, by praying for us, by praying for vocations and fostering knowledge of our life and the appreciation of our vocation. Let us pray for one another and be one in the love of Christ. 2. QUALIFICATIONS FOR A CANDIDATE. Religious: A candidate to our life would have to be baptized and confirmed male in the Roman Catholic Church and a practicing Catholic in good standing. The Roman Catholic Church gives us our calling and specifies these requirements. Some inquirers picture the possibility of being a monk without being a Catholic and certainly, the monastic impulse seems to be universally human. However, our monastic life is not an alternative to the Catholic Church and Catholocism permeates our way of life, no more than an individual could be a Christian monk without being a devoted follower of Christ. And the Church is the Body of Christ and we confess that they are inseparable. Health: A candidate needs to exhibit basic good health, both physical and mental. A doctor’s and dentist’s examination is a requirement for being acepted into the Novitiate. Both our work and our spiritual practices demand this capacity; so we ask that a candidate have no chemical dependencies or addictions; we wouldn’t even consider a smoker as a candidate. Social: A candidate must be unmarried or have an annulment from the Catholic Church. On one hand, vows could not be taken that contradict an already existing vow (e.g., a married man could not vow himself to the celibate life of a monk); from another perspective, we’d expect a mature candidate to take responsibility for his previous decisions. A candidate could have no dependencies like children still in their minority who depend upon him for support. Similarly, we could accept no one with criminal charges or litigation impending or debt. Age and Education: A candidate would have to be over 22 years old and have some work experience. A candidate needs to be able to read and apply himself to classes in the Novitiate and Juniorate. No one has to be a genius or an exemplary student–just capable and co-operative. The classes aren’t academic exercises but provide tools for understanding, practicing and loving this vocation; classes are geared to the capabilities of each candidate. No college is required. But a candidate who aspires to ordination must have the capacity to do the seminary studies required by the Church. If you are in school right now and wonder whether you should drop out to drop into the monastery, please talk this over first with your family and an advisor you trust. You may regret that step otherwise. The Abbey will be here waiting for you and you can stay in touch with us and even visit while you’re completing your degree. We chant our prayers but you don’t have to be a professional singer or a muscian to join us; we don’t chant to put on a good show but to focus and discipline our communal prayer and to endow it with dignity and beauty. Chant isn’t opera: anyone can be taught to chant. There is also a form you can fill out online and send. The information requested on that form is a blueprint of topics that would be helpful to mention should you chose to write a letter. You should receive a response as soon as possible. Except for basic data–name, address, other contact information, age, family–your other reflections will be kept confidential. None of what you write will be used for any commercial purpose. After some correspondence, you’re free to spend some time in our Retreat House. During such a visit, you would meet with Br. Efrain and have the chance to ask questions, express your sense of a call or discuss whatever might be relevant for your vocation-discernment. Eventually you can ask to do an Observership. The Observership, or being an Observer in the community, is the opportunity to live in the Abbey for three months, to work and pray with the community and experience how this life “fits” you. You are under no other obligation than to keep our schedule meet with the Novice Director and be responsible for yourself. You get to “observe” the community and size us up as we experience your potential with us. You may come away from that experience saying, “Thanks but no thanks”. Or you may wish to enter the community. Were you accepted by the Abbot, we’d ask you to spend at least one month away from the Abbey. You could settle practical matters (property, family needs, whatever) and prayerfully think about your experience here; you would have a medical check-up, see your dentist and, perhaps, an eye doctor. If you come back, you’d be a postulant for a year, participating again in the life of the community as before, but as a part of the community. After that year you could petition to be a novice. When your petition is accepted, you’d receive the novice’s habit and become a part of the Order. Vocation and Formation. Our vocation is a demanding one and not for everyone! It also has little to offer to those ill at ease with human company, responsibilities or work. Monastic spirituality has its feet on the ground and is focused by very mundane concerns, requiring generosity of spirit and the desire to serve others–and be challenged by them. The particularly Benedictine challenge of our life together is the commitment to Stability: we bind ourselves to this particular community in this particular place for life. To learn to be lovers of the brothers and the place is a life-long education. During the years of Postulancy, Novitiate and Simple Profession we can at least identify what impedes that education. The formation program, structured by Church Law and our Order’s Constitutions, continues the discernment through one year of Postulancy, two years of Novitiate and at least three years (which may be extended to six) in simple vows. All this can culminate in the public profession of life-long commitment to our calling by Solemn Vows. The Adventure of a Monastic Vocation. We may remain in the same place with the same people, year after year, but it’s precisely that stability that allows us to dig deep in a single, small place. It’s as if we’re excavating an interior space to allow God’s mysterious and salvific work into our lives and our world. More than ever, a lifetime in a monastic community is the chance to explore the riches and depth of the Catholic tradition, to learn how to contribute to the common life and live inter-dependently; to build a life alternate to consumerism, competition, polarization, self-absorption and materialism. In the monastery we have the possibility to mark the stages of life with ritual and sacrament, the freedom to face our mortality and learn, over and over again, how to take responsibility for what we have done and become the people God created us to be. What other venue, today, offers such a challenge? To continue the discussion, contact our vocations director, Br. Efrain, by emailing brefrain@virginiatrappists.org.